Product Description: This lavishly illustrated book on the famous automobile manufacturer traces the Studebaker family from its arrival in America in 1736, to the beginnings of the wagon business under John M. Studebaker and his brothers in the nineteenth century, to the family’s entry into the automobile industry in 1902, to the last Studebaker automobile to roll off the assembly line in 1966. The book, however, is much more than the story of a family business; it is also, in microcosm, the story of the industrial development of America. The Studebakers had always been industrialists in the sense that they made their living by manufacturing things, albeit on a small scale. When the Industrial Revolution hit the country with full force, spurred on by the Civil War, it transformed America from a rural-agrarian society into an urban-industrial one. The fortunes of the Studebaker family were transformed with it. 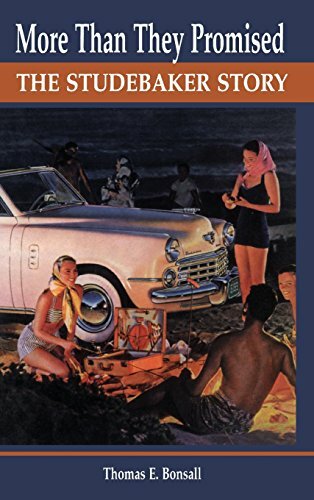 As the title suggests, the Studebaker story was mostly one of success. Studebaker wagons and carriages were long noted for their quality and popularity, and so, too, were Studebaker automobiles. The 1953 Starliner and the 1963 Avanti, designed under Raymond Loewy’s direction, are widely regarded as among the most innovative examples of American industrial design. The book deals in detail with the soaring prosperity of the company in the 1920s, the bankruptcy and miraculous recovery in the 1930s, the stupendous success of the early post-World War II period, and the eventual decline of the company’s fortunes in the mid-1950s. It describes the development of such famous models as the Lark, Avanti, and Gran Tourisimo Hawk, with special attention paid to the Avanti II, a surprisingly successful spinoff from the dying company that continued to be produced until 1991. The final chapter, on why Studebaker died, is tightly reasoned and more convincing than previous theories. Throughout, the author has used personal incident and characterization to bring to life the rich, tumultuous history of one of America’s longest enduring industrial empires.